Each of our sessions are digitally broadcast live and feature 3 separate presenters focusing on a specific aspect of some WordPress topic. Each presentation will have roughly 30-40 minutes allotted for instruction and 15 minutes allotted for Q&A at the end. This means that each session runs approximately three hours start-to-finish. Our presenters this month are Alison Barrett, John P. Bloch and K.Adam White. 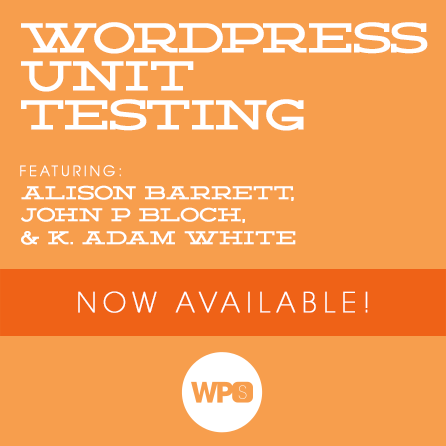 These experts really know their stuff when it comes to writing and running unit tests in WordPress. “What is a unit test,” I hear you ask? A unit test is a way for programmers to validate that they code they’ve written is serving its intended purpose and producing the expected results. There are many ways to test code, and this way happens to be a very, very good one. Check out our blog for more information on the benefits of unit testing, and the role it might better play in your business. This session will be broadcast live on November 30, 2013 starting at 1pm ET. All recordings will become available for replay at 4pm ET. Unit Testing for jQuery – Can it be done? If so, how? Alison works for Automattic, the wonderful company behind WordPress.com (and many other good things). She works in the “janitorial department” building in-house solutions that help the team run better. Alison is a relative new-comer to unit testing, which makes the lessons she’s learned all the more relevant to anyone just beginning the trek into unit testing. She loves making WordPress plugins, and also learning more about the WordPress APIs, both of which are primary focuses on her blog, Aliso the Geek. John has been working with WordPress for more than half its current life span. John currently works for 10up as a Senior Web Engineer where he helps build powerful and user-friendly solutions for our awesome clients. He is very passionate about building stable, tested solutions and wants to share this passion for excellence with you.